Robin has called NC home for close to 4 decades, she attended Enloe High school and then continued her studies at NC State University. She graduated NCSU with a degree in Environmental Design, which led her to corporate America then onto pursuing her passion in Real Estate. She settled in at the OBX & worked with a leading local firm, Sun Realty. As luck would have it she returned to Raleigh! She is the proud mother of three fabulous college students – one a graduate from Meredith, and the other two attending NC State & UNC-Wilmington. 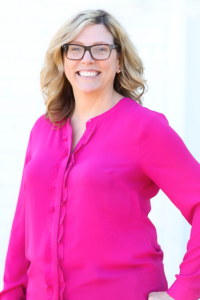 In her free time it is likely that you’ll find her cheering her alma mater on at a football game or enjoying a hike at Charles Joyner Park in Wake Forest. You may even see her playing a round of golf at one of our many rated golf courses. And let’s not leave out, Robin has a green thumb & enjoys gardening. She enjoys all Raleigh has to offer and as an added bonus it is the perfect distance from the mountains and the beach. What makes her great at real estate is her experience not only in corporate structure, navigating three kids (let’s face it we all know how teenagers can be!) but also dealing directly with different types of real estate transactions from first time home buyers, empty nesters, foreclosures & short sales. She has been licensed in real estate since 2006. You’ll love her warmth, fun spirit & get to it attitude. Contact Robin today at Robin@HREGSells.com or 252-305-2012 to help you with finding your next place to call HOME.